A masked student at the University of Missouri–Kansas City used a squirt gun to shoot a substance at Michael Knowles while he spoke at a Young America’s Foundation-sponsored lecture Thursday night. While it smelled like and appeared to be bleach mixed with some kind of glitter, further analysis revealed it to be an unknown odorous liquid. 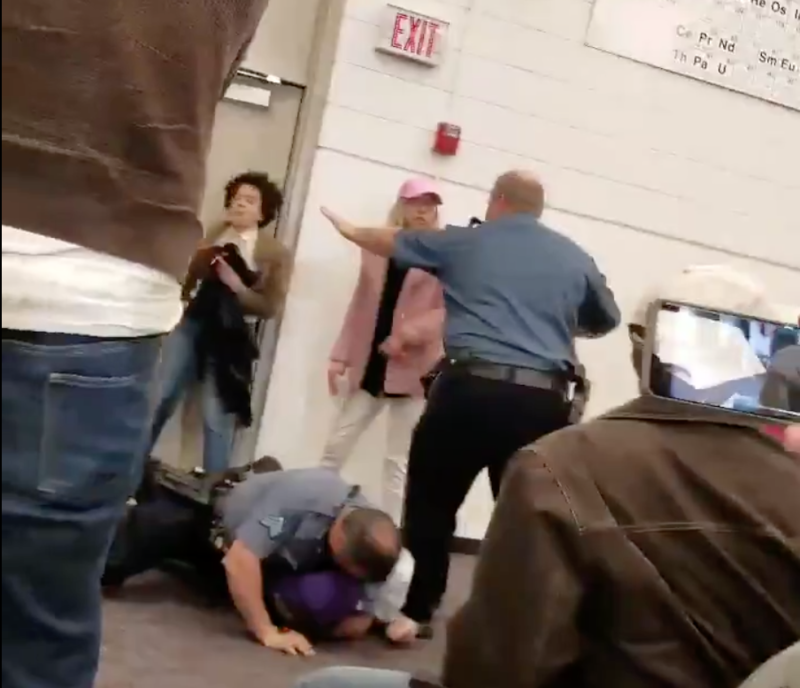 While this is hardly the first time a YAF lecture has been disrupted by radical leftists, this attack was a significant escalation of what’s normally seen on campuses. Law enforcement officers present at the lecture acted heroically and decisively to take down the masked attacker and restore order to the lecture hall, but UMKC’s chancellor has chosen to respond with a milquetoast letter that does nothing to condemn the atmosphere of intolerance that evidently festers at his school. 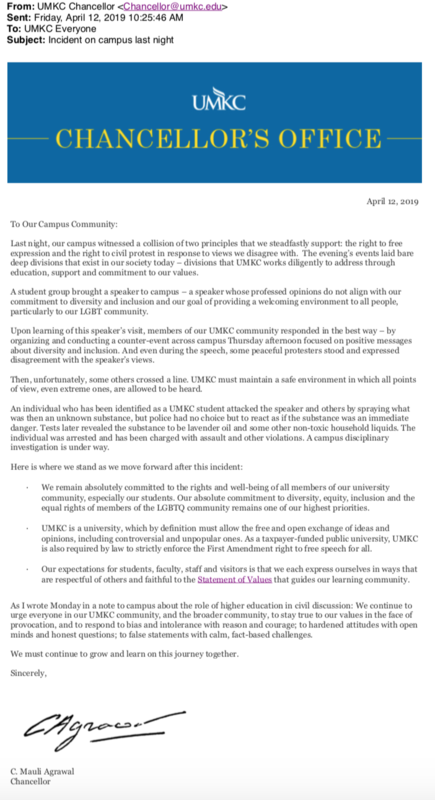 Calling the unprovoked attack on Knowles a “collision of two principles that [UMKC] steadfastly support[s],” Chancellor C. Mauli Agrawal cedes any authority to be a leader. A leader does not equivocate violent intolerance with civil protest. Agrawal’s letter is a clear showing that he intends to do nothing to encourage actual open debate or the free and open exchange of ideas, but instead be an apologist for the radical leftists whose intolerance toward conservatives and their ideas turned violent. Shame on Chancellor Agrawal, and shame on the students who continue to lash out and trample the rights of others merely for holding conservative views. In a bulleted list dripping with leftist doublespeak and do-nothing claims, Agrawal says that moving forward, his school will “remain absolutely committed to the rights and well-being of all members of our university community”—unless of course, they’re conservative.